The Schwinn 170 Upright Bike is an exercise bike anyone should consider when looking for a new item to add to his or her personal gym. The exercise bike, part of Schwinn’s 2013 line, is black and grey, with a sleek, metallic look. It comes with a large display that comes with a variety of preloaded programs and features. The bike itself weighs roughly 71.8 pounds and measures 41 by 22.5 by 13 inches. 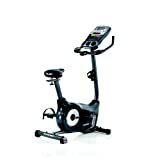 The Schwinn 170 has a list price of $699.00 but is currently on sale for $399.00. Listed below are some of the pros and cons of this unit. Main console features a dual LCD display, allowing users to view up to 13 different types of feedback at once. Console is programmable for up to four different users. This allows for up to four people to maintain and trace their exercise statistics when using the bike. This particular exercise bike feature 29 unique programs. Some of them are considered endurance programs, while others train for speed or weight loss. The programs model real-life biking conditions like mountains, trails and other outdoor features. Users can also manually program their own courses and store them within the console’s memory. The console features a cooling fan which has multiple speed levels. The bike’s console also has a USB port that can be used for charging and/or data exchange. Users can keep track of their stats via a feature called SchwinnConnect. The Schwinn 170 features a large, padded seat that is meant to provide as comfortable a ride as possible. However, if for some reason the user wants to change the seat to a more standard, road bike seat, he or she may do so. The seat post is a standard size and will support other types of seats. Seat and handlebars can be easily adjusted to fit different sized individuals. The handlebars can be tilted to different angles, and the seat can be raised or lowered and moved toward the console or away from it. Bike features 25 different levels of resistance. Users can easily change the resistance mid-ride, creating more challenging exercise routines on the fly. The frame is sturdy. It is meant to support the weights of a variety of people. Console has two large speakers for audio output. The bike has an eighth-inch input jack for audio devices. Handlebars have removable forearm rests and heart rate monitors. Schwinn provides several warranties for the bike: 10 years for the frame, two years for mechanical issues, one year for electrical malfunctions and 90 days labor. Pedals come with oversized toe straps to help keep users’ feet on the pedals while riding. The bike is relatively silent. Riders are provided with a smooth, quiet ride when exercising on the Schwinn 170. This is helpful when watching television or listening to music during workouts. Users can choose three different types of programming. They can choose to bike for a certain amount of time, for a designated heart rate or for a specific calorie count. The bike features transport wheels so the it can be easily moved from one location to another. There are also integrated levelers so that the unit can easily be leveled once moved to a new surface. Users can use the bike while standing up if they choose. The console has a natural shelf that can be used to support reading material, a smart phone or some other thin mobile device. A drink carrier is stationed underneath the display console. The display is backlit, making it easy to read in darker environments. The console is very large. For bikers who like to watch television while they exercise, this may be a problem. The television would have to placed higher in order to see over the very large console. When biking a certain amount of time, say 45 minutes, the user has to input this time every time he or she exercises. The unit does not store typical exercise times. This bike takes a while to set up. The instructions take some careful reading prior to assembly. Some have complained that the calorie counter is not very accurate. Manual does not go into detail on how to read and change many of the display module’s feedback options. Users can discover these on their own by trial and error, but it takes some time. The fan is a bit weak, particularly for people who are taller. The airflow is not quite strong enough to effectively reach larger users. Bike can only support users who weigh 300 pounds or less. Larger users will not be able to use this bike. Adjusting the seat can be a little difficult. It requires the use of a couple tools to bend it up or down. The bike is not meant to be pedaled backwards. Other models sometimes have this feature built in. Even though there are a few features that could be improved, overall, the Schwinn 170 is a bike that is worth considering. Features such as the high-tech display module, the fan, the audio input and the large amount of programs and resistance levels outweigh any of the minor negative features for this bike. Other bikes like the Sole Fitness B94 Upright Bike, the Diamondback Fitness 910Ub Upright Exercise Bike, the Bladez Fitness PTS68 Master Indoor Cycle Trainer or the Kettler Giro P Programmable Upright Bike may have more or different features. However, each of those bikes is more expensive than the Schwinn 170. 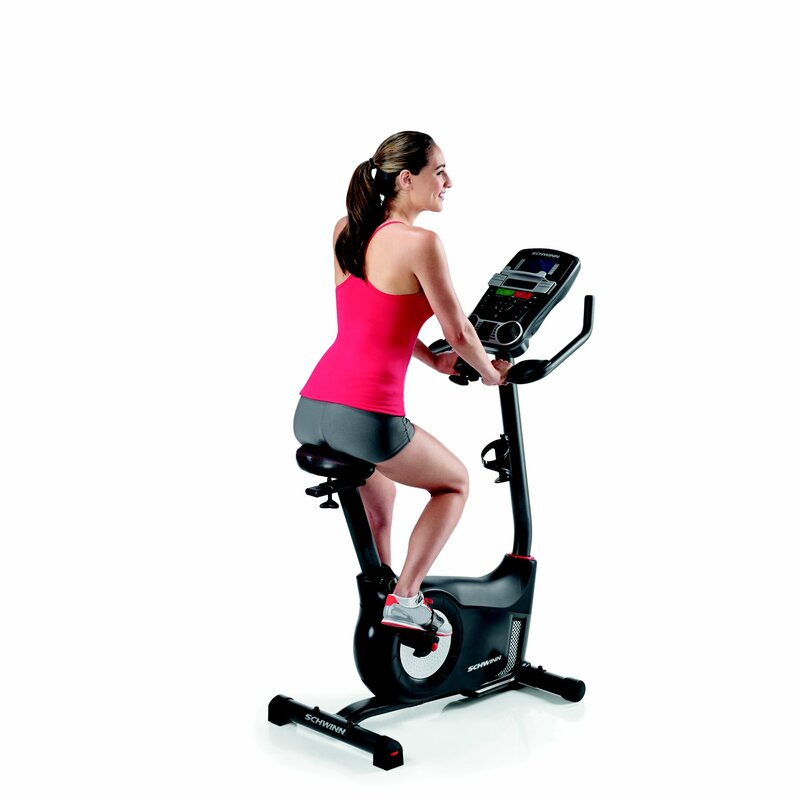 Overall, the Schwinn 170 Upright Bike is loaded with features and is sold at a reasonable price.